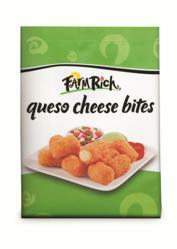 Farm Rich introduces Queso Cheese Bites - delicious, bite-sized snacks filled with creamy white queso cheese - along with the new Pesos 4 Quesos contest. Cold weather is almost behind us, so Farm Rich is bringing some heat to its popular line-up of frozen snacks and appetizers with the new Queso Cheese Bites – delicious, bite-sized snacks filled with creamy white queso cheese. Starting March 21, fans can also play Pesos 4 Quesos for a chance to win a $3,500 “Fiesta Grande” from Farm Rich. Visit the Farm Rich Facebook page and click on Pesos 4 Quesos to play and register to win weekly $200 gift cards plus the chance to take home the $3,500 grand prize—worth over 44,000 pesos! By reaching certain game levels, players can also earn coupons to try the new Queso Cheese Bites. The Pesos 4 Quesos contest closes on May 4, just in time for Cinco de Mayo, when the grand-prize winner will be announced. Fans can also visit http://youtu.be/IqR7hJU9VG8 to watch a special Pesos 4 Quesos video message from Farm Rich. Available nationally at Walmart stores and other Farm Rich grocery retailers for an average retail price of $6.99, each bag of Farm Rich Queso Cheese Bites contains 53-56 pieces. The bite-sized snacks come out of the oven or fryer in just minutes, crisp and toasty on the outside, meltingly tender on the inside, and ready to serve for an after-school snack, party appetizer, or just any time hunger calls. The wholesome snacks also are a good source of calcium, and each portion contains just 180 calories and 0 grams trans fat per serving. As the newest product from Farm Rich, Queso Cheese Bites join a line-up of popular frozen snacks and appetizers that includes Cheese Sticks, Mini Pizza Slices, Mozzarella Bites, Stuffed Pretzel Bites and more. To learn more, visit http://www.farmrich.com. A leading brand of Rich Products Corporation, Farm Rich (http://www.farmrich.com) is based in St. Simons Island, Ga., and features a successful portfolio of frozen snacks and appetizer products sold at grocery and club stores nationwide. Featuring the tagline, “Keep ‘em Happy,” Farm Rich makes wholesome, great-tasting snacks that are sure to please family and friends. Visit http://www.farmrich.com or the brand’s Facebook page at http://www.facebook.com/FarmRichSnacks. Follow on Twitter at @farmrichsnacks. Video is available on YouTube at http://www.youtube.com/farmrichsnacks. Editor’s Note: Product samples and additional photography available on request.